Designed by Miguel Zarcos Palma, today we are going to see how beautiful and transforming a facade can really be. Using a gorgeous project as the backdrop, we are going to see how different materials come together to create a harmonious design that is as elegant as it is eclectic and trendy. The point of today's homify ideabook is not only to take you on a wonderful tour of this gorgeous home, but also to show you the improvements that you can make to the exterior of your home,which can change the whole style. From the front of the home, you can see exactly what we mean about the different materials. The wooden facade, white exterior finishes and black charcoal wall creates a harmonious, yet eclectic exterior that is modern and trendy. We often think that we need to keep our design uniform, which means sticking to one or two colours throughout the exterior but this just shows that this is not the case. Opt for a few tones and colours and you can bring texture and personality to the outside of your home. What's also important to remember is that the outside of your home is the first impression that people are going to have of what your house looks like, which is ultimately an extension of your tastes and styles. You don't want to disappoint! Spend as much time focusing on your exterior design as you do on your interior design. The design is incredibly modern and bold, with chunky white blocks, glass banisters and wooden slats. The volume and the shapes create a very prominent and impressive exterior. 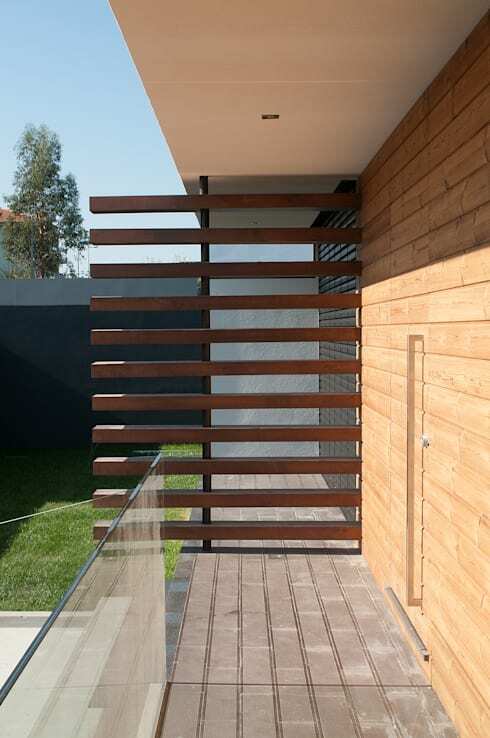 Don't you love the wooden slats that protrude from the one side of the home? It just adds that little edgy and creative twist to the home! 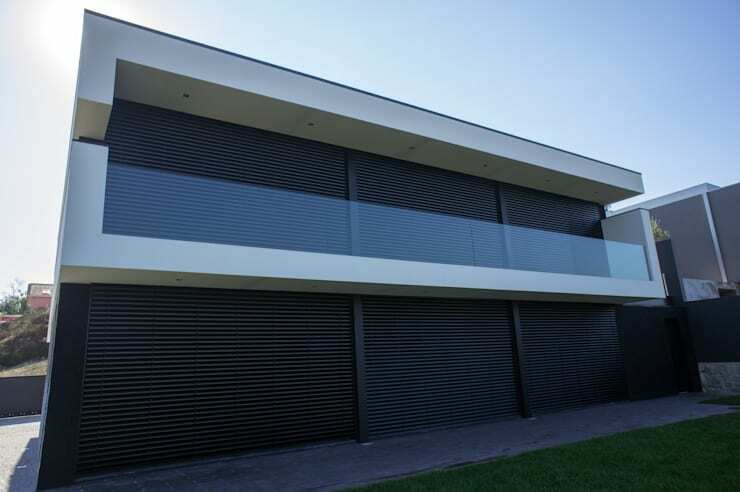 Do you like how the designers have used glass throughout the exterior of the home? Have a look at these: 8 great ways to furnish your home with glass. If we look at the wooden slats a little bit closer, we can see how they form a little bit of a barrier between the one side of the exterior and the other. This is a more transparent barrier, allowing for a fluid flow between the two spaces. We can also see in this image how the different shades of wood work beautifully with the surrounding grass and garden, blending into the nature around it, while still remaining prominent. You can also really get a sense here of how different tones, shades, shapes and materials work together. From this angle, we can see how the designers have gone for a darker and cooler look on this side of the home. It creates a very sophisticated and elegant look that contrasts beautifully with the other side of the home. The steel look on this side of the home almost looks like a garage door has been pulled down over the windows throughout the exterior. Very slick! The texture is also very trendy, enhancing the boldness of the exterior, without making it look too thick or imposing. Again, the balcony is surrounded by a glass banister, adding a little crisp touch to the look and feel. You'll also notice the lighting on the ceiling on the balcony—a wonderful part of an exterior design. 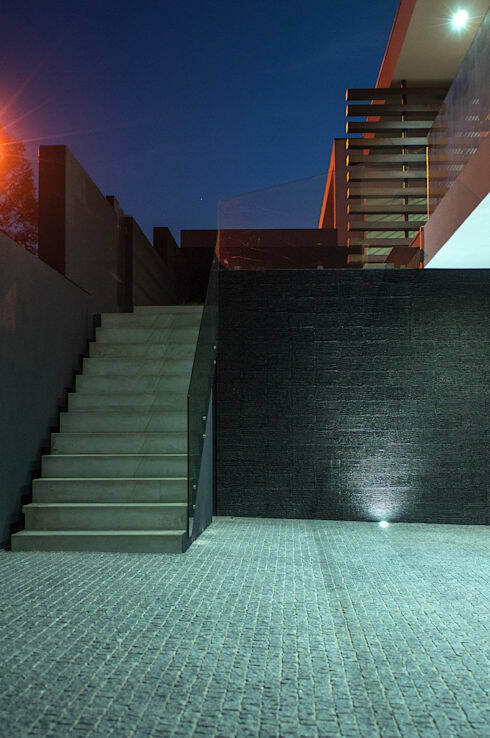 You want your facade to be completely enhanced and lighting is the way to about it, especially at night. Have a look at the homify balcony lighting for inspiration. We end off our tour looking at this trendy and stylish exterior staircase. It runs parallel to a large, charcoal wall that features texture and style. In unison with the rest of the home, the staircase features a glass banister that softens the very rugged look. It works in beautiful contrast with the concrete slab stairs. We can also see how the designers have used facades to really play with the different levels of the house. Don't you love how each level takes on a different ambiance? 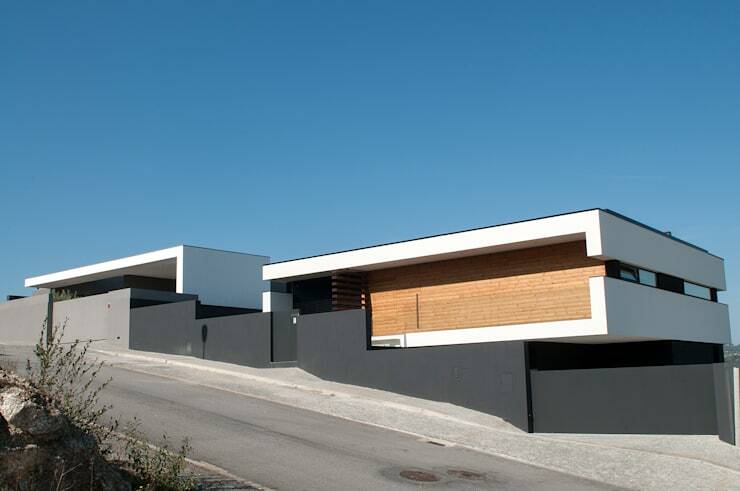 This is a home that shows you just how much fun you can have with facades. It's time to create something beautiful for the outside of your home! 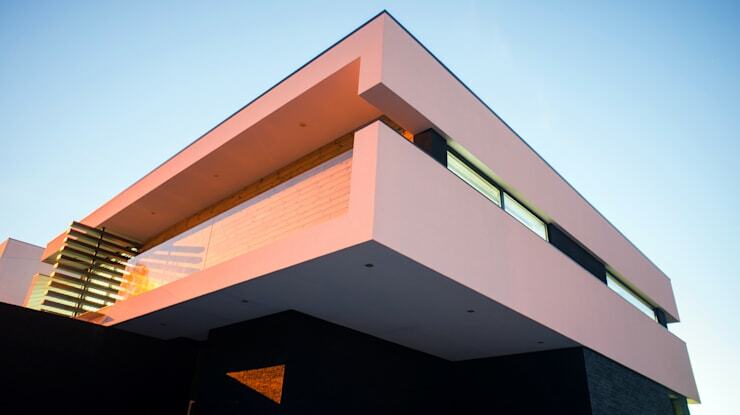 Do you believe that facades can transform your home?